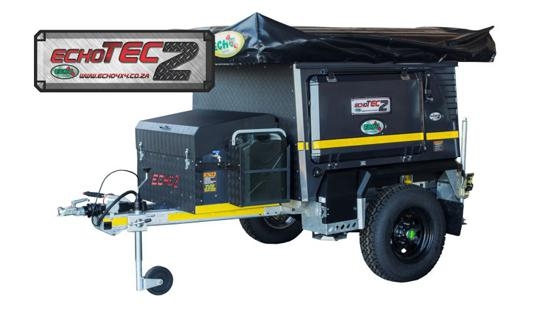 The Echo tec 2 off-road trailer is the first of the Echo Tec range. Based on the Echo 2 trailer, The Tec 2 has ample packing space making it perfect for overlanding or any outdoor adventure. Made from high quality durable materials that allow it to endure the toughest conditions.This camper is designed down to the finest detail with no feature overlooked. Features such as High lift Jack points and excellent departure angle further adds to its off road ability. Convenience of a quick setup and easy accessibility from 3 sides; allowing you to get to your gear easily when you need it. With the TEC 2 you can fully enjoy your travels, no matter where you go. Additionally independent suspension as a standard feature, the Echo tec 2 has brilliant handling off road and on road.